Anyone try this product from Home Depot? Looks like it's replacing Glidden Duo. 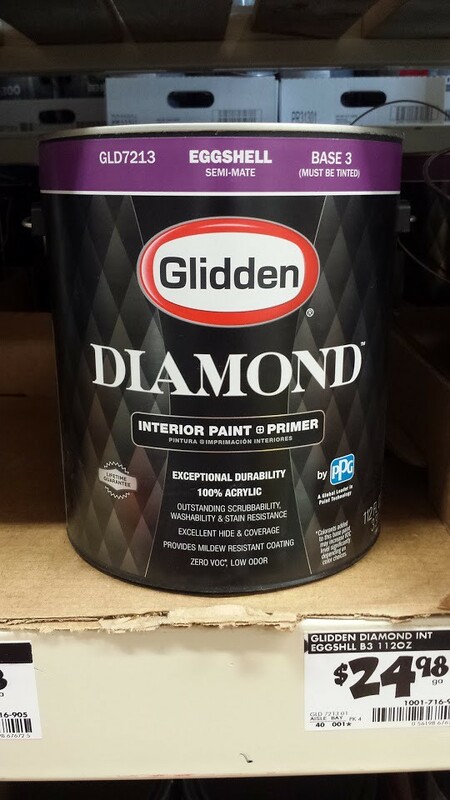 Haven't heard anything, but Glidden had Dulux Diamond in the main stores. I rarely get in the PPG store these days to know about all the changes that came with the Glidden/PPG decision. I'll check for it next time I am at the depot. Here's a picture of the can. Glidden Diamond has been running a commercial on HGTV (not this video) that talks about the scrub cycle being 2,500 scrubs. Just so you know, that means Diamond passed the MPI #138 Gloss Level 2 scrub test and any other paint listed on #138 also passed such as Sherwin Williams Duration Home, Sherwin Williams Pro Tech and SuperPaint. There are only 24 on the list. Behr Marquee and Ultra, Benjamin Moore Aura and Regal Select, Valspar Signature Hi-Def and Perennial. Even PPG's Speedhide is on the list. Well. I regret to say Glidden Diamond failed a quick test. That's not to say Diamond is not good at the claims, but we didn't even get that far. 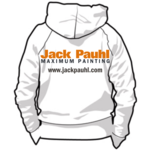 Paint has to meet a production standard or it's too expensive to apply. I am giving you my take on the product based on how we need to use it, not how the world might use it. If I were to write a review, it would include things that I'm not going to say here. John and me agree, Diamond is slow to roll despite its low viscosity. 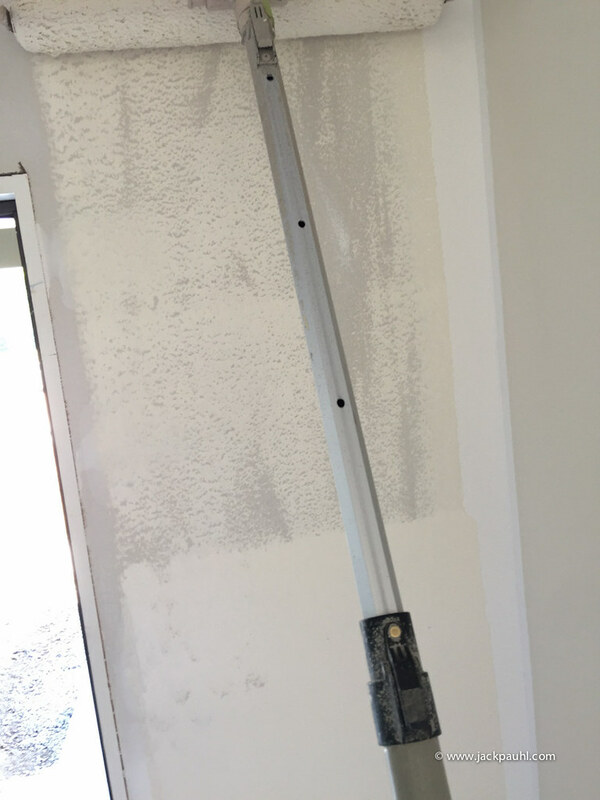 The paint is difficult to spread evenly over bare drywall compared to other thicker paints. That's important to us in a Paint and Primer in One product. One load of paint only went floor to ceiling on an 8' high wall on bare drywall. Applying Glidden Diamond eggshell over itself went 3 widths of the 18 inch roller compared to 1 width on first coat. I typically like to see one load of paint go 3 widths of the roller. What should have taken one guy 1 hour and 40 minutes took two guys 2 hours and 20 minutes. Just for kicks, I reduced 1 gallon by 6 ounces of water. It helped a bit with spreading quickly but not enough. Surface wetting seems to be an issue over bare drywall. I may have more to add later, but for now, we won't be using it again on new construction. Thickness sample. 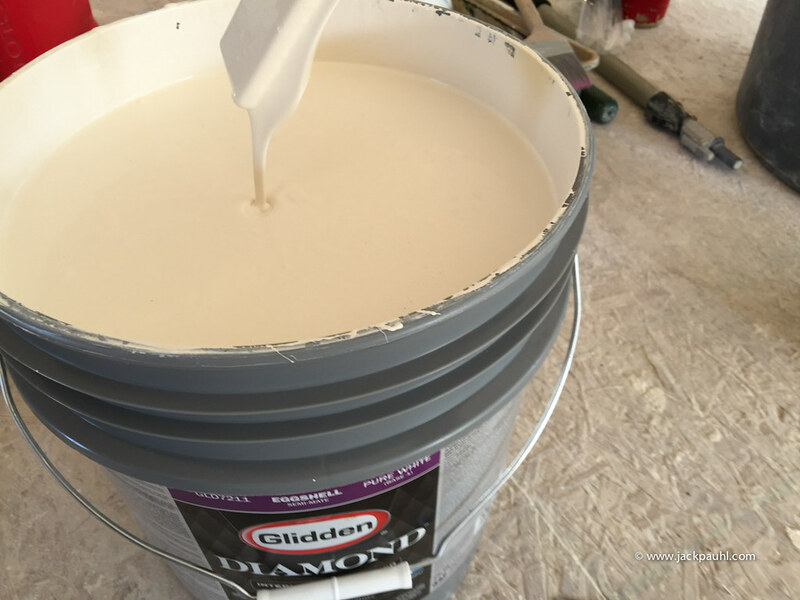 Glidden Diamond is not thick in the bucket. You can see here the paint passes straight through itself without accumulating on the surface. That low viscosity is deceiving because it doesn't translate on the wall. On the wall the paint is clingy and slow. Take a look at the previous photo. I started with a heavy load and worked the lower half next to the door. I started low and moved upward, then down to the floor then back up past my first stop point. That is the solid area separating the light area. Because the paint is clingy, the roller was not able to transfer it to the upper portion of the wall. That's no good! No good at all. 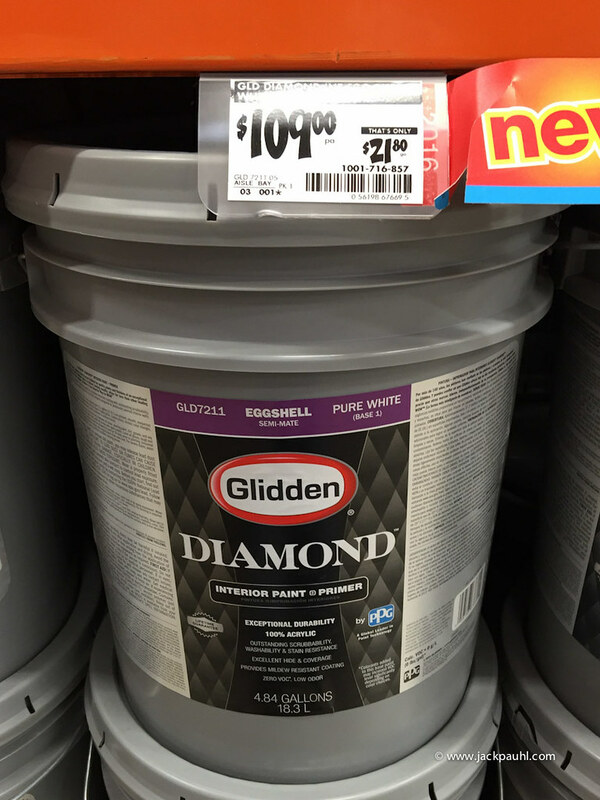 Glidden Diamond at Home Depot 5 gallon price. Behr Ultra Eggshell is $140 at the time of this post. Back in April, it was both Ultra and Premium Plus. Did a job a month ago were the customer had the paint on site. Diamond was the paint and I too was not impressed. Ultra Hide 250 is the same way. Looks to be about the perfect viscosity but drags and clings like a son of a gun. I said the same thing to John.